We think of Queen Elizabeth I as ‘Gloriana’: the most powerful English woman in history. We think of her reign (1558-1603) as a golden age of maritime heroes, like Sir Walter Raleigh, Sir Richard Grenville and Sir Francis Drake, and of great writers, such as Edmund Spenser, Christopher Marlowe, Ben Jonson and William Shakespeare. But what was it actually like to live in Elizabethan England? If you could travel to the past and walk the streets of London in the 1590s, where would you stay? What would you eat? What would you wear? Would you really have a sense of it being a glorious age? And if so, how would that glory sit alongside the vagrants, diseases, violence, sexism and famine of the time? In this book Ian Mortimer answers the key questions that a prospective traveller to late sixteenth-century England would ask. Applying the groundbreaking approach he pioneered in his bestselling Time Traveller’s Guide to Medieval England, the Elizabethan world unfolds around the reader. He shows a society making great discoveries and winning military victories and yet at the same time being troubled by its new-found awareness. It is a country in which life expectancy at birth is in the early thirties, people still starve to death and Catholics are persecuted for their faith. Yet it produces some of the finest writing in the English language and some of the most magnificent architecture, and sees Elizabeth’s subjects settle in America and circumnavigate the globe. Welcome to a country that is, in all its contradictions, the very crucible of the modern world. Okay, another must-have! I have his Medieval England book. Haven't cracked it yet (of course), but I will get around to it...eventually! Have you read the Medieval England book? This series looks so interesting. They are high on my wish list. They mucst make a great resource for writers. I can't wait to read this one. 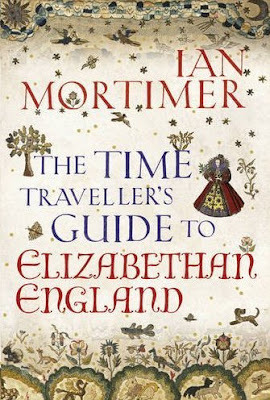 I loved The Time Traveller's Guide to Medieval England and expect this new one will be just as good. Normally I avoid everything Tudor (it's so overdone), but this looks quite interesting! You hit exactly on what I think about when I read any historical novel. I want to know from all the classes of people as to what food they ate; the clothes they wore; where they lived and how their homes looked, etc. Queen Elizabeth I was such a dynamic Queen who left an amazing legacy. Thank you for the review. The book sounds great! I absolutely love books like this, and it's comforting to know that the research and credentials of the author are solid. It goes on the list for sure!